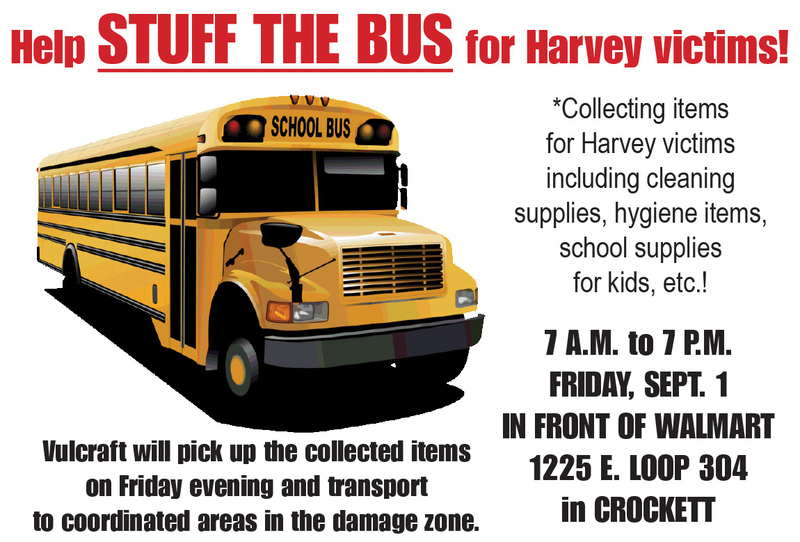 A “Stuff the Bus” collection drive for Harvey victims will be held from 7 a.m. to 7 p.m. Friday, Sept. 1 in front of Walmart in Crockett, located at 1225 E. Loop 304. On Friday evening, representatives from Vulcraft, a division of Nucor, located in Grapeland, will pick up the collected items and transport to coordinated areas in the Harvey damage zone. Among the items to be collected are cleaning supplies, hygiene items, school supplies for kids who have lost theirs in the storm, etc.